The Cane Toad is a Key Threatening Process to the Australian Nation. THE TOADS WOULD BE BUSTED!! Toad Busting over the last couple of weekends, has taken on a whole new dimension for our volunteer Kimberley Toad Busters. Souring temperatures and high humidity, ‘Hughy’ dumping when one least expects it, slippery muddy slopes, merciless March Flies and the relentless task of extracting millions of toad tadpoles and toadlets from the boggy edges of billabongs and streams are just a few of the things sent to try our intrepid teams. And despite these conditions our teams are still having fun and bagging lots of toads. Bagging a ‘Toad’ at night along the muddy banks of some of the billabongs has produced some hilarious moments, with Sue Roberts taking the major award for her outstanding mud skiing demonstration. Not to be deterred by the fact that the toad spotted by husband Phil was several meters below a rather wet muddy slope, Sue leapt to the challenge and net in hand, ‘skied’ towards the toad, and without losing balance scooped the toad up in one swoop and managed to maintain both her balance and the toad until she reached the soft muddy creek bottom. The ‘extraction’ of Sue and the toad from the creek created further hilarious moments for the team. Sue and Phil’s son Manu Roberts and Joel Hamling, two of our younger toad busters for the weekend managed to give everyone a new insight into the meaning of ‘muddy’ boots! No mud bank or pool deterred their enthusiasm for ‘bagging’ their toad catch. Kimberley toadbusters Leaders with their teams for the last two weekends included Chris and Tina De Mero and teams, Annie Fitzgerald, Anthony Scott-Virtue, Michael Rogers, Georgina Wilson, Del Collins, Bruce Russell, Cathy Cummings and Wendy Carter were able to take their teams into several major tadpole and metamorph infested billabongs and creek areas. Although it was impossible to net everything, checks of the areas by team members the following day showed a significant reduction in population numbers. Georgina and I used a very fine mesh net, and although a rather wet and muddy exercise, this proved to be a far more efficient way of pulling out large numbers of tadpoles at once. However, once our very own Leaf Blowers and Compressor arrive we will definitely be utilising those resources for the management of tadpoles and metamorphs. Edal and Nadia Rogers, Montana Awon, Joel Hamling and Manu Roberts all won special prizes for their toad busting abilities, and are all now official junior Toadbuster Leaders. A total of 259 toads were caught on the weekend of the 10 th & 11 th. Almost 60% were large gravid females. 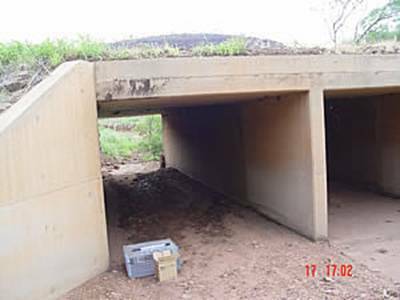 Most of the cane toads caught by the team over the weekend were located in the culvert systems under the Victoria Highway and along the edges of the road. The majority of toads found in the CALM traps were also female. 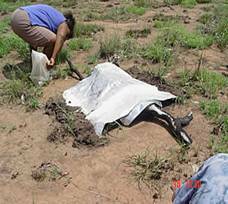 This supports that move of females away from the river to breed in smaller creek systems and newly created waterholes from the recent rains. It is anticipated that the number of big breeding females caught should decrease over the next couple of weeks. Observations from this weekend toad busting indicated that the intermittent rains experienced over the weekend enabled the toads to move more freely along washaways leading to the road culverts. The increase in toad numbers found in the CALM traps also showed that those traps located near road culverts were catching the most toads while those located further away were either still not catching or were only catching minimum numbers. Road kill (dead toads on the road) were found to have the highest density near culvert systems, again confirming that toads making their way from the Victoria River were predominantly using the culvert ‘washaways’ to move away from the river. During the weekend of the 17 th & 18 th158 toads were busted, 104 females and 54 males . A further 17 (11 female) toads were ‘busted’ the following morning. Only 40% of the females appeared to be capable of carrying up to 30,000 eggs (a very strong contrast to the previous weekend). The remainder were within the middle range in size and appeared to be carrying small numbers of eggs (obviously a second generation) and these observations by the Kimberley Toad Busters team needs to be analysed at a scientific level. However, our own observations show that despite the larger percentage of females being smaller and probably only carrying around 15,000 eggs we estimate we stopped around three million one hundred and seventy five thousand eggs being laid. A further 59 cane toads (31 females) were busted by Chris Spur during the week. Pam Steele is also out in the field independently busting and as time goes on we expect to see more trained leaders working independently and with teams during the week as well as on weekends. CDEP, schools and other organisations will gradually organise to have teams in the field for up to week at a time. New library of reference books to help our team to identify native vertebrate species. We are currently building a special award system for our junior teams to encourage an interest in learning about the general ecology of the areas we are toad busting in. New Safety Equipment for Kimberley Toad Busters! The new safety equipment donated by Biodiversity Protection Inc has finally arrived. It is all labelled and new registration sign in/out forms have been designed. Team leaders will be allocated a range of equipment on a ‘permanent’ basis and will be in charge of overseeing that their teams are adequately provided for. This equipment will be returned to Kimberley Specialists if the Team Leader in charge of the equipment is no longer functioning in that job. A full list and photographs of the equipment donated by Biodiversity Protection Inc will be loaded onto the Community Website www.canetoads.com.au early next week. Thanks to Del Collins, President of the Lions Club, the process of having our Kimberley Toad Busting Volunteers signed up under the Lions Volunteer program is now well underway. The Leo section of Lions will also cover our children twelve years and over. With the combination of the CALM volunteer Insurance and the full comprehensive Lions Insurance cover our volunteer teams will finally be working under a sustainable insurance package. The donation of safety equipment such as first aid kits, a fire extinguisher, safety vests, whistles, hand held radios, Two Way Radios and GPS equipment (only to name a few) by Biodiversity Protection Inc has also contributed to the safety of our volunteers. Kimberley Specialists, Sarah Brett and a few other members of our Kimberley Toad Busters met with the Minister Dr Judy Edwards on Wednesday during the CAWG meeting called by Gae Mackay. 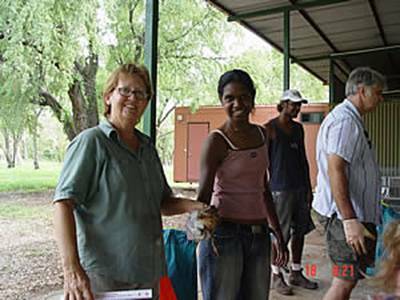 Kimberley Specialists provided a powerpoint presentation of some of the activities our Kimberley Toad Busters have been undertaking in our fight to stop the cane toad from crossing into WA. Some very serious questions were presented to the Minister on the role of STTF in the on-ground activities currently being undertaken by our Kimberley Toad Busters Community Volunteer Group. 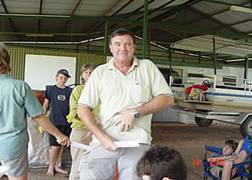 Questions were also asked about the flow of money from STTF into the Kimberley Toad Busters. 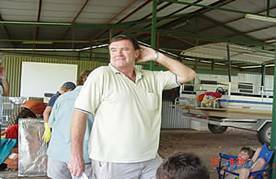 General feeling was expressed that the STTF should focus on fund raising and marketing and that funding should be channelled through the shire and then directed where needed for the Kimberley Toad Busting activities. We hope to see a number of the concerns our Community has in regards to the role of STTF resolved shortly. Without doubt we need the whole state working together on the fight to keep the cane toad out of the Kimberley . Our Toad Busting Team successfully last weekend trailed the first of the traps being made under the direction of Chris Spur at TAFE. Each team will now carry these into the field with them to set them up in each of the areas being busted. When our team has the required number of traps needed for our stage two trapping program we will begin to place traps into the field for several days at a time. Report by Chris and Tina De Meros. Did a reconnaissance in the afternoon of the 10 th and 11th walked approx 2km. Due to heavy rains found no metamorphs and very few tadpoles. Returned at night walked approx 2 1/2 ks and busted only 4 toads. We noted this time we did not see any native frogs either. Did a reckie in the afternoon , found it to be almost inaccessible due to the heavy rain , the mud was like quicksand and we struggled downriver for less than 1k - there were no metamorphs but we saw more tadpoles than Joes Creek and they were much smaller. Returned at night but the conditions were even worse, spotted a small croc but no adult toads at all. Due to the heavy rains the rock pools of tadpoles are now fast flowing murky creeks which made using the blower impractical. The good news is we busted 51 toads along the road from lost creek to Vic River Roadhouse. The toads are using the road as a corridor. We also noted approx 20+ toad splatters on the road - all close to the roadhouse. We left the 55 toads with Dell for weighing , sexing and euthanasia . That's it from the De Meo team until we get back 1st Feb , have a great Christmas , all the best for your wedding and happy toadbusting !!! 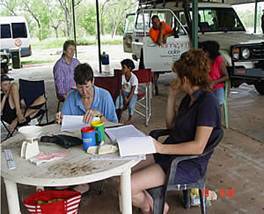 Over 20 Kununurra residents descended on the Victoria River again this weekend. Teams split up to cover various creeks and areas. 158 toads were busted, 104 females and 54 males. Generally, compared to previous toad busts, smaller toads were found & smaller metamorphs. There were also less tadpoles, metamorphs and fully grown toads than found in the same area on previous weekends. The toads seemed to be more active on the roads than by the creeks. On Joe’s Creek the cane toads & native frogs appeared to occupy generally different pools. There were still plenty of sightings of native frogs. Toads were calling at temporary wet season billabongs on both the south-west & south-east sides of Lost Creek. Picked up more gravid females. Males could be becoming stressed looking for partners here! Hundreds of cane toad tadpoles found on the Escarpment Creek walk. 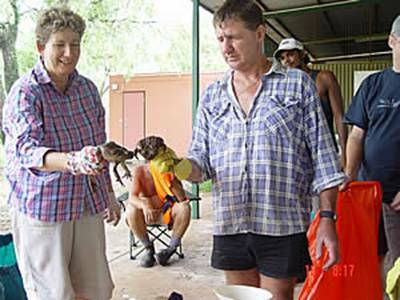 Hundreds of cane toad metamorphs found at Joe’s Creek. Nobody is too young or too old in this fight to stop the cane toad from crossing into Western Australia . If you don’t have a vehicle we can always find a seat on the Triple J Toad Busting Bus. IF EVERYONE BECAME A TOAD BUSTER.